Because we are a car buying service, and also, specifically, a car buyer’s agent, we are often asked about how to get the best possible deal on a car. Then we are asked if it is better to buy sale by owner, or from a dealership? Which is the better deal or best price? The answer, as are the answers to most questions regarding a car purchase is, “it depends.” There are so many variables that go into pricing cars these days, particularly on the internet. For example, many car dealers are now using “vAuto” which means, when you find a used or pre-owned vehicle on a search engine and then contact the dealership to determine price, many dealers will now tell you that the price is the price, because they used vAuto. Alternatively, you can pour through Craigslist (as just one example) to see what good FSBO (For Sale By Owner) cars are out there, but sometimes it is more difficult to determine the private seller’s trustworthiness because a dealership’s reputation is generally far easier to research. At Car Pal, our rule of thumb for measuring a good selling price is to use Kelly Blue Book (www.kbb.com) as a pricing guide. While this site isn’t 100% accurate, particularly on certain models, such as Toyota, however, if the sales price at a dealership or FSBO is close to the KBB private party value, it is generally a reasonable price. If you are lucky enough to get an even better price than the KBB private party value, then pat yourself on the back! Then make sure the vehicle lives up and/or exceeds your every expectation despite the lower than average price. We will provide a used car checklist in our next blogpost. Anything that causes you to roll your eyes or scratch your head. Consumers don’t need to rely on a car buyer’s agent to make sensible decisions. Though we are useful for taking the lion’s share of the research and time consuming interactions that take place when searching and then purchasing a car, truck or SUV. All of us can benefit from the old adage, “When in doubt, don’t.” This works quite well when making the determination if a previously owned vehicle should become your “new to you” vehicle. 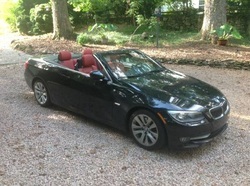 ** Vehicle above is actually for sale at the time of this writing, be sure to look at it if you dream of driving into the glorious fall foliage in a brand new to you, barely pre-owned black BMW 328i automatic with red leather interior. This was a special order from Germany in 2011! Just click the photo itself to be directed to the listing.